Definition: Leadership includes capacity to provide direction, align people, mobilize resources and reach goals; management includes capacity to plan, budget, organize and guide people to achieve results. Strengthening professional associations to provide leadership amongst their constituencies. Involvement of wide range of stakeholders in policy and decision-making processes (professional associations, researchers, unions, private sector, FBOs). Addressing the Health Workforce Crisis: A Toolkit for Health Professional Advocates Health Workforce Advocacy Initiative of the Global Health Workforce Alliance. Creating a Work Climate that Motivates Staff and Improves Performance. The Manager, Management Sciences for Health (MSH), 2002. Guiding Principles for National Health Workforce Strategies Health Workforce Advisory Initiative of the Global Health Workforce Alliance. Managers Who Lead Toolkit: Resources to Support Managers Who Lead. Management Sciences for Health (MSH), 2005. The Right to Health and Health Workforce Planning: A Guide for Government Officials, NGOs, Health Workers and Development Partners Physicians for Human Rights, 2008. Workgroup Climate Assessment Tool and Guide for Facilitators. Management Sciences for Health (MSH), 2003. Empowering Primary Care Workers to Improve Health Services: Results from Mozambique’s Leadership and Management Development Program. 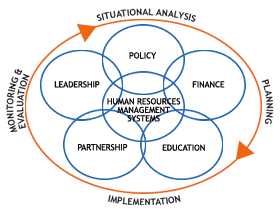 Human Resources for Health, 2008. Human Resource Leadership: The Key to Improved Results in Health. Human Resources for Health, 2008. Strengthening Management Capacity. World Health Organization, 2008.